With episode three, The Legend of Korra really starts to get into the meat of the plot, and the way it moves from the smaller scale of episode two into the series arc is really quite well done. Episode two was heavily focused on Probending, with Korra ultimately joining the Fire Ferrets as a permanent member of the team. Episode three starts with the Fire Ferrets needing to pay an entry fee for the tournament, a fee they cannot hope to afford – so Bolin takes an opportunity that presents itself, and gets himself into trouble in the process. This pulls Korra and Mako right into Amon’s plot and makes it impossible for Korra to simply train with Tenzin and the Fire Ferrets and ignore the revolution that’s happening in Republic City. 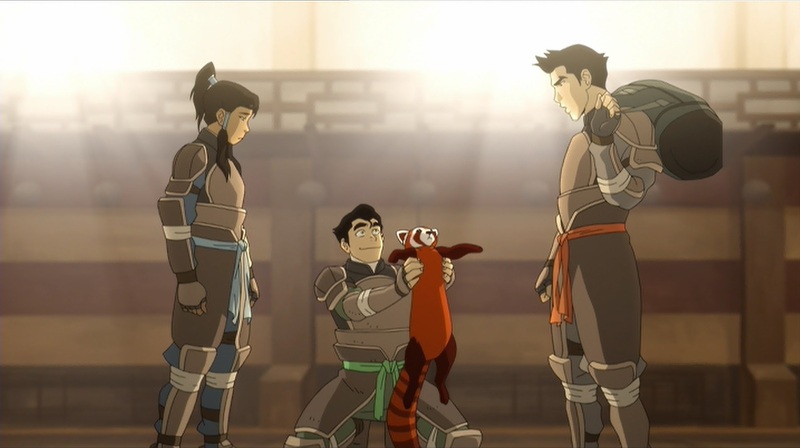 Backing up a little, first, though, when the Krew are discussing the 30,000 yuon championship entry fee, Mako asks for ideas, but then scorns the first thing Bolin suggests – an animal circus starring Bolin’s pet fire ferret Pabu. Having dismissed this idea, rather than ask Korra for suggestions or continue to brainstorm as a team, Mako instead says “Don’t worry, I’ll figure something out. I always do”. This and all other images used are the property of Nickelodeon and used here under fair use for review purposes. He’s decided to take on the responsibility himself. He has no thought of teamwork, no consideration that the others might have a valid input. He assumes the responsibility. He might be the team leader, but he isn’t a team player; no wonder Bolin’s so naïve, if Mako does everything without giving Bolin a chance to join in. It makes me wonder if perhaps the departure of the Fire Ferrets’ original third player, Hasook, in the previous episode was about Mako’s poor leadership. Mako later complains that Bolin has a knack for getting into stupid situations, but perhaps that’s partly Mako’s fault, for not communicating with his brother and not listening to him. On with the story: while Korra returns to Air Temple Island for her airbending training, Mako finds work at the power plant and Bolin attempts to make Pabu a star. Two quick asides here: I love the statue of Zuko firebending where Bolin sets up his Pabu-circus. A nice reference to the original show to those of us who have seen it, without interrupting the flow of the episode. Secondly, an error the show makers didn’t catch: after being given a coin, Bolin says, “One yuon down, 49,999 to go” – though the tournament organiser said the fee was 30,000 yuons. Bolin is approached by a former acquaintance, Shady Shin, and is tempted into some “security work” which Shady Shin is assures him is “nothing crooked”. 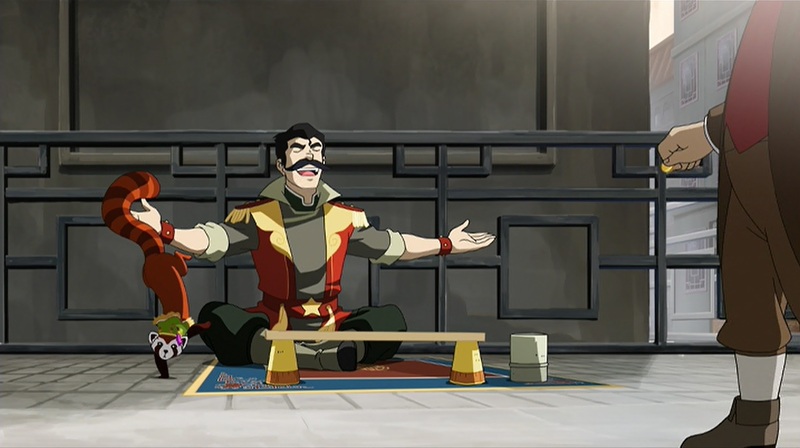 When Mako gets home and finds Bolin isn’t home, he goes to see if Bolin is visiting Korra – but refuses Korra’s help until she insists and suggests they bring Naga along to help. Mako trying to solve everything himself again. 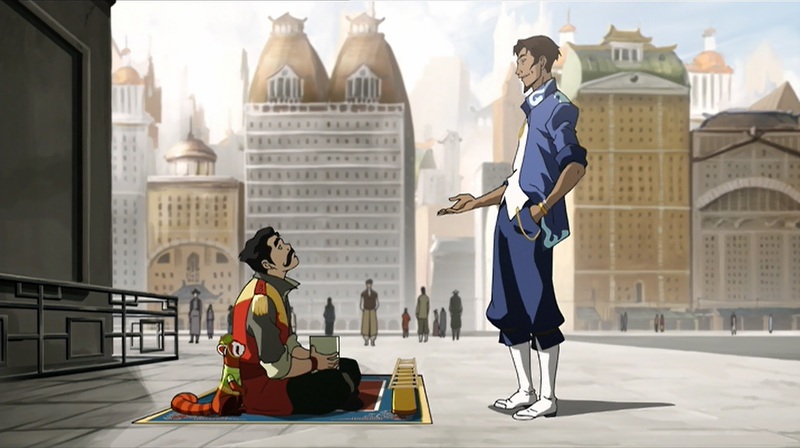 Korra and Mako speak to a street kid and learn that Bolin went with Shady Shin of the Triple Threat Triad, and that the triads, criminal gangs, appear to be engaged in turf wars. We saw this side of Republic City when Korra first arrived; the criminal underworld is evidently a problem for the city. When it turns out that Bolin and Shady Shin have been kidnapped by people wearing strange masks, Korra and Mako make chase. Korra hasn’t learned from her first encounter with Chief of Police Lin Beifong, because she’s not above ripping up public roads to try to stop the kidnappers. 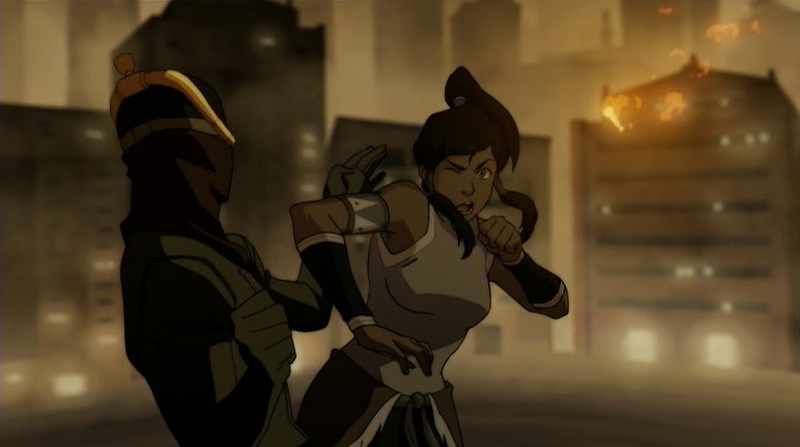 The kidnappers turn out to be chi-blockers, like Ty Lee in the original series, who can cut off Korra and Mako’s ability to bend with a few precision jabs. This is a serious threat to Korra, who relies on bending to achieve her goals and for whom bending is a core part of her identity. Mako reveals that he and Bolin are orphans because a firebender killed their parents during a mugging, and that they know people like Shady Shin because surviving alone on the streets as children is tough. After a little intimidation on the equalist activity Korra met on her first day, and solving a remarkably easy puzzle, Mako and Korra find out where the “Revelation” equalist rally will be taking place that evening, and make their way there. Amon is pretty clever with his speech. He starts with a story of his childhood, of a firebender extortionist who killed his family and scarred him. He sets up benders as villains, criminals – using a parallel city dwelling non-benders may already be familiar with, benders as extortionists. And it also echoes Mako’s story of a firebender mugger; Republic City is no paradise, but rife with inequalities and a serious crime problem. Going from a firebending criminal to Avatar Korra, Amon draws an implied link. He then sets up a pseudo-debate with Korra by stating what her argument would be if she were there, a simplified version of it, which he then easily opposes with his own, more detailed counter argument. 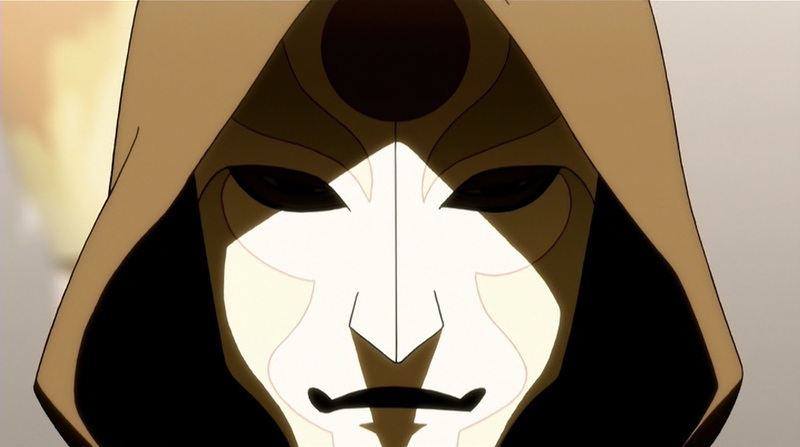 His audience are given the impression of having heard both sides of the argument, but really they’ve only seen Amon’s, since Korra neither had the opportunity to present her argument herself nor to counter Amon’s claim. Having set up bending and benders as being evil, Amon goes on to make an extraordinary claim, of having been contacted by the spirits and given a mission and the means to complete it – the power to permanently remove a person’s bending ability. It’s a ridiculous claim, but Amon backs it up with a demonstration. And here he is truly masterful: having set up benders as criminals, he brings out a notorious criminal who is also a bender, Lightning Bolt Zolt, to demonstrate his ability to remove a person’s bending. 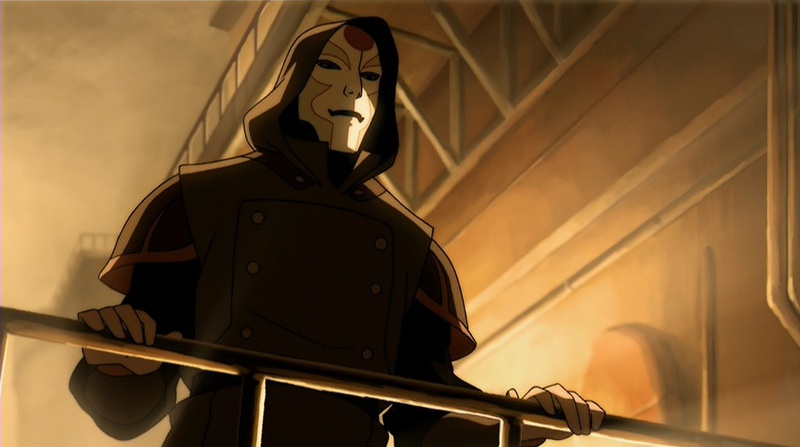 And because Amon can remove Zolt’s bending, his audience are persuaded that his claim that his comes from the spirits, and that Avatar Korra no longer represents the spirits. Looks like Zolt has cast his last lightning bolt. The demonstration also serves to reinforce Amon’s claims that benders are criminals and casts Amon in the light of a saviour, protecting people from criminals like Zolt at the same time as creating equality by making everyone a non-bender. 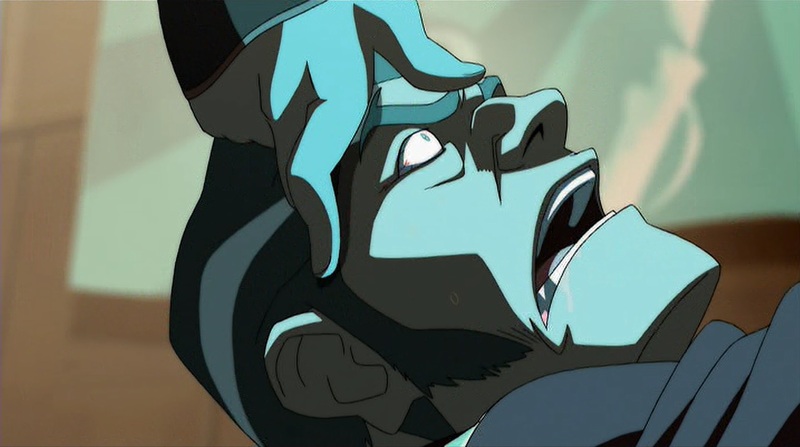 The threat of removing bending is here permanent, where with the chi-blockers Korra and Mako encountered earlier it was temporary. That earlier sequence, it now becomes clear, is foreshadowing for the real threat Korra is to face, the threat of being cut off from her bending, of being no longer the Avatar. This is a direct threat to Korra’s identity, and the identities and abilities of thousands of benders. As Korra and Mako begin to enact their plan, we get a nice reference back to the previous episode. Korra is somewhere she shouldn’t be, but this time the “looking for a bathroom” excuse fails, and Korra has to dodge a wrench swung at her. Then it’s time for Mako to get Bolin and for them all to get out again – but not before a fight with a very agile equalist using electrified batons to incapacitate Mako and Bolin. 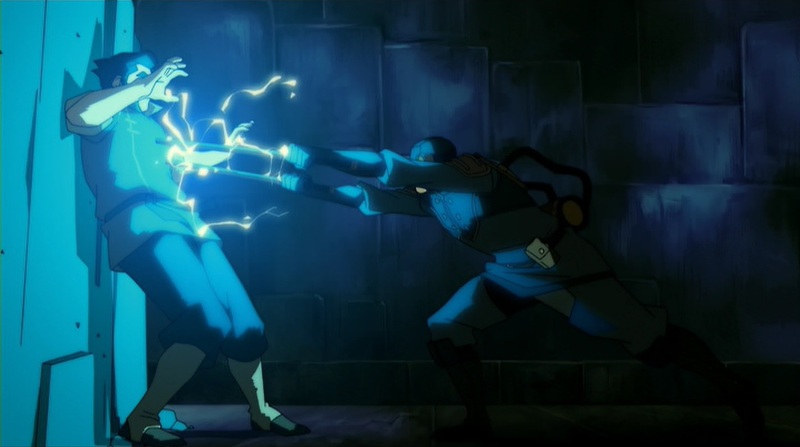 This gives a bit more variety to the fighting than just being up against chi-blockers, but it’s still a good thread – lightning bending is an elite skill of firebenders, so only the most powerful firebenders can truly defend against it. Amon commands his followers to let the Krew go – the Avatar is the perfect messenger for his power. Having revealed his ability, he wants to use it to strike fear in the hearts of benders all over Republic City. He has already persuaded non-benders that benders are not to be trusted, but now benders have a reason to fear non-benders, and Amon in particular. The city will divide – and fall. Amon: “Let her go. She’s the perfect messenger to tell the city of my power.” Creepy.